Her Majesty's Flag flies to victory in Duchess Stakes! Trained by David Cotey for owners Dominion Bloodstock and Barry Butzer, the chestnut daughter of Midshipman-Regal Point arrived at the seven furlong 'Poly' sprint for sophomore fillies from a disappointing run in the grassy Alywow Stakes. However, Her Majesty's Flag overcame a bout with thumps following the Alywow effort and redeemed herself with an energetic stretch run to earn her first added-money score. Midnight Milley was slow from the gate in the Duchess, but rallied quickly up the rail under Alan Garcia to assume command through splits of :22.96 and :45.29 with her four rivals stalking in close proximity. Pohdi Pohdi and Her Majesty's Flag advanced through the turn with the latter moving best of all to secure a 3/4-length win. Roaming rallied late to earn place money, a neck in front of Pohdi Pohdi. Her Majesty’s Flag covered seven furlongs in 1:22.91. Moreno was full of praise for Her Majesty's Flag. "I thought we were going to be a little further away, but she was so comfortable being up there and when I asked her she just kept going. She felt good today," said Moreno. Her Majesty's Flag graduated at first asking on May 23, 2014 with a rallying effort in a maiden allowance sprint and completed the campaign with a fifth-place run in the Glorious Song Stakes. The chestnut opened the 2015 campaign with a good 1 ¾-length score in an optional claiming sprint, before off-the-board finishes in the Grade 3 Selene and Alywow. Bred in Kentucky by Sun Valley Farm, Her Majesty’s Flag banked $75,000 in victory while improving her record to three wins from six starts. She paid $39.70, $14 and $4 combining with Roaming ($3.90, $2.80) for a $143.80 (6-5) exactor. A 6-5-1 triactor (Pohdi Pohdi, $2.10 to show) was worth $223.40. Watch This Cat was scratched. Ball Dancing waltzes to victory in the $500,000 Sands Point! Saturday's Grade 2, $500,000 Sands Point at Belmontcame down to a battle between two Chad Brown-trained fillies with French formlines. Although Xcellence appeared to be going the better of the two as she poked her head in front in midstretch, it was her stablemate, the newly repatriated Ball Dancing, who found more to prevail in her U.S. debut. Previously based in France with Pia Brandt, Ball Dancing was last seen finishing a dead-heat fifth in the June 15 Prix de Diane (French Oaks), in which Xcellence was third. That marked her final start in the colors of MD Bloodstock Ltd. The Kentucky-bred daughter of Exchange Rate was subsequently acquired by W.S. Farish and F. Steve Mooney and transferred to Brown. Her arrival in New York gave her a chance to turn the tables on Xcellence, who had in the meantime also joined the Brown barn. Ball Dancing was dispatched as the 5-1 fourth choice, with 5-2 favoritism going to Sea Queen and Xcellence the 7-2 second choice. Sea Queen grabbed the early lead and posted steady splits of :25 2/5, :50 2/5 and 1:14 4/5 on an inner turf labeled firm, but that was in the process of absorbing rain. The Brown fillies were patiently handled near the back of the nine-runner field. Under Joe Bravo, Ball Dancing commenced her circling move on the far turn, but Xcellence was hot on her stablemate's trail as they swung into the stretch. Although Sea Queen tried to dig in on the inside, she could not resist the onrushing duo. Xcellence telegraphed that she had plenty up her sleeve, headed Ball Dancing, and for a few strides looked to have her measure. But Ball Dancing had yet to play her final card. Coming again in deep stretch, she edged a half-length clear in a final time of 1:50 for 1 1/8 miles. "Chad had a lot of confidence in this filly," Bravo said. "She'd been training great and he got to know her. How impressive was it at the eighth-pole when she got passed? How much heart did she show to come back and win it? With European horses making their first start here, it's mostly a matter of making sure they're comfortable with their surroundings. Chad does some much homework with these horses, it made my job easy." Sea Queen checked in another 1 1/4 lengths back in third, followed by her stablemate from the Christophe Clement barn, Walk Close. Next came A Little Bit Sassy, Daring Dancer, Duff One, Miss Besilu and Queenofzeenile, who always trailed after getting bumped on both sides at the start. The main-track-only Aqua Regia stayed in the barn. Ball Dancing, who paid $12.60 to win, improved her scorecard to 6-3-1-0, and the $300,000 winner's share boosted her bankroll to $396,282. Bred by Kirk and Deby Wycoff in the Bluegrass State, the dark bay sold for $55,000 as a 2012 Keeneland January yearling. She was offered at TattersallsOctober later that year, but RNA'd for $134,434. Unraced as a juvenile, Ball Dancing was sixth in her unveiling on Chantilly's synthetic March 31, but broke her maiden over males, at the same track and about 1 3/16-mile trip, April 16. She promptly followed up by taking her stakes and turf debut in the May 11 Prix de la Seine at Longchamp. Runner-up in the 1 1/2-mile Prix de Royaumont at Chantilly June 1, Ball Dancing cut back in trip for the French Oaks two weeks later at the same venue, and performed creditably to be beaten about two lengths by Arc-bound Avenir Certain. Ball Dancing is a half-sister to three other French black-type performers -- stakes winner Putyball, Group 3-placed Palomar and stakes-placed Hayhaat. They were all produced by the unraced Silver Hawk mare Ball Gown. With her third dam being Irish champion juvenile filly and 1966 One Thousand Guineas heroine *Glad Rags II, Ball Dancing descends from the family of Belmont Stakes winners Union Rags (2012) and Colonial Affair (1993). Ball Dancing, produced from the Sun Valley mare Ball Gown, becomes the 179th stakes horse from mares sold by Sun Valley Farm. Her Majesty's Flag Flies Memorial Day Weekend! Her Majesty's Flag, a two-year-old Sun Valley homebred, is the second winner for her freshman sire, Midshipman at Woodbine! Showing 30-1 odds at post time,Midshipman’s two-year-old filly, Her Majesty’s Flag wasn’t getting much respect at all in her first career start. Well, she’s getting all the respect now with an impressive off-the-pace win in a four and one-half furlong maiden event at Woodbine Racetrack in Canada. Breaking out of the one hole, the chestnut juvenile gained the lead for a brief instant and then settled in at the back of the field. As the group of two-year-olds turned for home, Her Majesty’s Flag was set down for the drive by jockey Sky Chernetz and was able to pull away in the final strides. Bred by Barry Butzer’s Sun Valley Farm, Her Majesty’s Flag is owned by a partnership between Butzer and Dominion Bloodstock. She is out of the winning Point Given mare Regal Point, a half-sister to G2 winner Regally Appealing and to Stakes winner Regal Miss Copelan, dam of G2 winner and previous Darley stallion Rockport Harbor. Midshipman won the G1 Breeders’ Cup Juvenile and G1 Del Mar Futurity en route to two-year-old championship honors as North America’s best juvenile of his year. He is also the sire of winner Sunny Yellow who also won his first-ever career start in late March. Gamay Noir pulls shocker in Rampart Stakes-G3! "I claimed her for running a route on dirt," Wolfson said. "When I ran her in Tampa she got in all kinds of trouble. She should have won. (Jockey) Paco (Lopez) rode her just like I wanted, where she makes one run, three-eighths of mile on the outside. "Not off her last race at Tampa," Wolfson added when asked if he was surprised she won. "She ran huge. You had to see it visually. She got in all kinds of trouble and should have won that race. I never would have run her back this quick, except for the way she ran. He is the perfect rider for her, because he listens." Gamay Noir was unhurried early and settled in the back of the field. The 2-5 favorite and 123 pound highweight Devil's Cave sped out to the early lead to post fractions of :24, :47 3/5 and 1:10 3/5 as last year's Kentucky Oaks winner Unlimited Budget was latched onto the outside of her. "It was too much weight on (Devil's Cave), and I didn't think (Unlimited Budget) was going to push her like that," Wolfson said. Gamay Noir bided her time before mounting her rally three wide around the far turn. The four-year-old filly bumped with Private Ensign in the stretch before pulling away from that rival and running down the leaders in the final yards. "(At the top of the stretch) I had a lot of horse, and the other horse (Private Ensign) came over and forced me to come out," Lopez said. "I put my horse outside and she came over just a little bit and I took a hold, and my filly didn't have a problem. I went right by the other horse." Unlimited Budget got up by a neck over third-place finisher Devil's Cave. Private Ensign, Triple Arch and Oasis at Midnight completed the order under the wire. Call Pat and Molly Morgan were scratched. Gamay Noir covered 1 1/8 miles in 1:49 4/5 over the fast main track. The daughter of Harlan's Holiday broke her maiden in her second start as a three-year-old over a wet-fast Churchill Downs track last May. She finished fourth in her stakes debut in the Ta Wee over a soft Indiana Downs turf course in October and closed out 2013 with an 11th-place finish in the South Beach on the grass at this venue in December. Gamay Noir stayed on the Gulfstream Park turf to start the year in an optional claiming race in January and was claimed by her current connections following a seventh-place finish in that race. She switched back to the dirt to finish a well-beaten fifth in the Sabin over this track in February and was exiting a fourth-place finish in the Wayward Lass at Tampa Bay Downs earlier this month. With Saturday's win, the bay banked $90,000 to boost her bankroll to $195,366 from a 15-4-0-4 career line. Bred in Kentucky by Fares Farm, Gamay Noir is out of the Unbridled mare Uncork, making her a half-sister to Peruvian Group 2-placed Serafico. Her third dam is Lady Lady, who produced stakes scorer Lovat's Lady. The bay's female family also includes Grade 2 winner Apart, Grade 1-placed Grace and Power as well as 1974 Horse Of the Year in France Allez France. The horse farm is a pretty great place to live, and believe me, you never run out of things to do. From the first call that signals the first birth of the first foal of each New Year, really, there are no other words to describe it, it’s just “Game-On”. Then there’s number 38 or 39, the last foal you have been waiting for, and for a brief moment you think “Gosh, we’re done here”. Yeah, right. From there it’s six more months of grouping and sorting, new halters, farrier day, a sniffle and the occasional boo-boo, (and before you know it) sale day arrives. I always approach the Keeneland November Sale pouring over all of the activity that has ensued in the Thoroughbred sales arena the previous ten months. You maybe add in a dash of what’s happening in the world (that’s right-- ABC News, not Twitter) before you finalize your sales forecast, and then you hope… and pray. Sometimes fate intervenes on a Saturday afternoon, and the Saturday before the sale a swift son of Street Cry (Ire) wore a blanket of yellow and purple. Yes, New Year’s Day had just won the 30th running of the Breeders’ Cup Juvenile. Our first foal made his appearance at Keeneland on Wednesday (day 2), and this son of Street Cry (Ire), out of A.P. Indy’s classic-producing daughter, Miss Kilroy, took all day to get there. The eighth last horse on offer, but the faithful stayed on. Auctioneer Scott Caldwell exclaimed “He’s the one you’ve been waiting for”, and he did not disappoint, selling for $350,000 after a spirited bidding battle. Offered by James B. Keogh, Grovendale, (agent) James said of the colt “He’s a wonderfully uncomplicated colt, and he can walk for Ireland”. He did just that, and walked his way into the record books, becoming the fifth highest selling weanling colt of 2013. Most always, sales results are comprised of assorted singles and doubles and the occasional triple. Our very first offering had changed the game from the very start. Throughout the next five days foals from the Sun Valley draft provided a steady stream of sparkling results, $125,000, $90,000, $72,000, $70,000, $65,000, $50,000, $40,000 and $40,000. Fourteen of Sixteen (88%) found new homes for an average of $75,000, a 37% gain from the 2012 Keeneland November Sale results. In closing, I feel extremely thankful we were blessed with such a great offering of youngsters, and wish to express my thanks to all who patronized our consignment. All of our foals found homes with individuals and farms well noted for their horsemanship in getting the horse to the next level. It is especially gratifying that our homebreds offered in November found their ways into some of the great stables--, Darley/Godolphin, WinStar Farm and North America’s leading owners, Ken and Sarah Ramsey. After all, we are but seven weeks away from “Game-On” 2014. It is with the help of friends and clients like you, and our dedicated farm staff that brings results like these to a reality. Who knows?--, which of the Class of 2013, might well deliver on an upcoming Saturday afternoon. A pocket trip worked to perfection for Tale of a Champion and jockey Joe Talamo when they outfought favored All Squared Away in deep stretch to post a 10-1 upset in the Charles Whittingham Memorial Handicap (gr. IIT) June 8 at Betfair Hollywood Park (VIDEO). Trained by Kristin Mulhall for Kretz Racing, Tale of a Champion snapped a seven-race losing streak in his most recent effort, a starter stakes at Santa Anita Park March 30. The 5-year-old son of Tale of the Cat posted his first graded-stakes victory. With Talamo again at the controls, Tale of a Champion used a ground-saving trip for a one-length victory in 2:01.27 for 1 1/4 miles on a firm turf course. All Squared Away, the 13-10 pick who challenged the winner in the final furlong, settled for second under Corey Nakatani, with pacesetter Lucky Primo and Tyler Baze third, 2 1/4 lengths behind Tale of a Champion. Bred in Kentucky by Judy Hicks and Kathryn Nikkel, Tale of a Champion is out of the winning Seattle Slew mare If Angels Sang. "I think we've misplaced this horse in the past and he hasn't had the best trips," Mulhall said. "He feels like he wants to run two miles when he's galloping. I told the owner about five races ago I'd like to see him go a mile and a half." "We were trying to build his confidence up at Santa Anita (in his last start)," said Mulhall, who noted the Sunset Handicap (gr. IIIT) at 12 furlongs July 14 could be next for Tale of a Champion. Tale of a Champion raced a close-up third at the rail behind Lucky Primo, who held a one-length advantage over Slim Shadey on the outside through soft quarter-mile fractions of :25.13, :48.75, 1:13.66, and 1:37.79. Slim Shadey fell back leaving the turn, opening room for Tale of Champion to angle out between horses. With All Squared Away also charging from the outside, it was down to two leaving the furlong pole, with Tale of a Champion inching clear under left-handed urging from Talamo. "We really had a great trip," Talamo said. "He's really coming into himself. He really impressed me when he won last time. The race set up perfectly for him today. There wasn't much pace and he just sat right behind and at the quarter pole was able to come off the rail. "He fought off (All Squared Away). My horse felt his presence at the eighth pole and kept digging in." Tale of a Champion won for the sixth time in 14 trips and added $120,000 to his purse total, which now stands at $269,708. Tale of a Champion was produced from the Sun Valley mare If Angels Sang (Seattle Slew). With Hall of Fame rider Mike Smith aboard for trainer Chad Brown, the 4-year-old daughter of More Than Ready –Red Piano, by Red Ransom took charge from the outset in the 1 1/16-mile turf test contested as a steady light rain fell in Baltimore. With Silver Screamer and jockey Julien Leparoux giving chase, Pianist rolled on the firm turf, setting fractions of :23.39 and :46.65 into the backstretch. As Silver Screamer continued to hold second and grade III winner Hard Not to Like tracked in third under John Velazquez after a poor start, Pianist completed the mile in 1:34.61 while extending her advantage through the stretch to win by 2 3/4 lengths. Pianist, owned by Hidden Brook Farm and Don Zucker, hit the wire in a final time of 1:40.60, just a shade off the course record of 1:40.32 set by Precious Kitten on May 19, 2007. The win improved the 4-year-old filly's record to 5-1-1 in 10 starts, with earnings of $300,950. Bred in Kentucky by the Grapestock breeding division of Tom Simon's Vinery, Pianist was purchased by Hidden Brook for $100,000 from the Vinery consignment to the 2010 Keeneland September yearling sale. 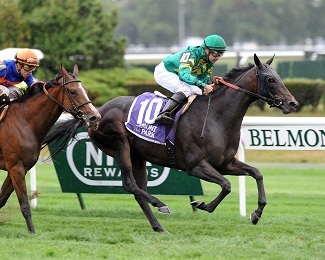 Pianist broke her maiden in her second start and earned black type with her first stakes triumph in the listed Given Stakes on a yielding turf course at Belmont Park last September. The Gallorette marked the second stakes and first graded win for Pianist. Pianst is daughter of the Sun Valley mare Red Piano (Red Ransom-Spinet). HOT SPRINGS, Ark. - Cyber Secret gave his owner, Charles Cella, one of the biggest thrills of his 55 years in racing when he ran down pacesetter Taptowne and then pulled clear by 5 3/4 lengths in the Grade 2, $500,000 Oaklawn Handicap on Saturday. Cyber Secret won before an ontrack crowd of 66,158, on what was the final card of the meet at Oaklawn. Fort Larned finished fifth as the 1-2 favorite in the Oaklawn Handicap, his second start since winning the Breeders’ Cup Classic last November. Trainer Ian Wilkes said he had no excuses for the defeat, and said the horse scoped clean following the race Saturday. “Maybe he just didn’t fire today. Sometimes those things happen,” said Wilkes. Fort Larned is to ship Sunday to Churchill Downs and could target the Alysheba, said Wilkes. Cyber Secret ($15), meanwhile, won his fourth straight race in the Oaklawn. He raced in fourth early under jockey Robby Albarado, as Taptowne took the field through fractions of 22.95 seconds for the opening quarter, 46.56 for the half-mile, and 1:10.97. Cyber Secret went after Taptowne in the stretch, forged his way past him, and then pulled clear to cover 1 1/8 miles on a fast track in 1:49.67. The win was one of the biggest in Cella’s racing career. The 76-year-old is the longtime president of Oaklawn and he raced champion Northern Spur. Lynn Whiting trains Cyber Secret, a horse Cella purchased privately a few years ago. Cyber Secret will head to Churchill Downs, with his next start to be determined, said Cella. Sabercat finished third, a half-length clear of fourth-place finisher Optimizer. Win Willy was sixth, followed by Atigun, Alternation, Unstoppable U, and Golden Ron. 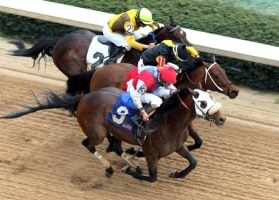 The Oaklawn Handicap was one of four major stakes that closed out the annual Racing Festival of the South. The program was led by the Grade 1, $1 million Arkansas Derby won by Overanalyze. Cyber Secret wins thriller in Razorback H-G3! Avoiding a wide journey that appeared to harm favorites Alternation and San Pablo, Cyber Secret tracked in fourth through the opening half-mile as Golden Ron led the way through splits of :23 4/5 and :47 4/5. Golden Ron still had a one-length advantage after six furlongs in 1:12 3/5, but making a rally turning for home were Cyber Secret on the outside and 4-1 chance Atigun along the rail. A tight battle among the three ensued down the stretch, with Golden Ron clinging to short lead between rivals inside the sixteenth pole. But Cyber Secret kept gaining with each stride and just edged clear before the wire, completing 1 1/16 miles on a fast track in 1:44 4/5. Atigun couldn't quite get past the top two, finishing only a half-length behind Golden Ron in third. The top three were well clear of the rest, with Brethren, Alternation, San Pablo, Najjaar, Donoharm, Ride the Lightning and Raison d'Etat completing the order of finish. "At the half-mile pole he was in the clear and it was his race to win or lose from that point," Whiting said. "He was able to grind them down. It was a good win, but I've never had a bad one. I'd think he'd deserve a chance in a race like the (Grade 2 Oaklawn Handicap April 13)." Cyber Secret has now won three straight this meet for trainer Lynn Whiting, preceding this victory with allowance scores on January 21 and February 15. The four-year-old went unplaced in three prior stakes appearances at two and three before concentrating on passing his allowance conditions. His record now stands at 13-5-1-0, $252,564. Bred in Kentucky by Paragon Farms, Cyber Secret was a $110,000 Keeneland November weanling. He was produced by the Dixieland Band mare Stomping, a half-sister to multiple stakes winner Open Toe. Both were produced by the stakes-winning Cyane mare Foot Stone. This female line produced Tempted, the champion older mare of 1959. Cyber Secret is out of the Sun Valley Mare, Stomping, who recently produced a filly by leading sire Unbridled’s Song. Sagamore Farm’s Walkwithapurpose took the lead when no other filly wanted it and was on cruise control the rest of the way to win the $100,000 Maryland Juvenile Filly Championship this afternoon at Laurel Park. Jeremy Rose is now three for three at Laurel on the daughter of Candy Ride. Co-favorite Hot Fun rallied from fourth to try and catch the winner but had to settle for second, eight lengths behind. Ignacio Correas trains Walkwithapurpose, who completed the 7-1/2 furlong distance in 1:32.67. “She’s incredible,” said Correas. “She does things very easily and is starting to mature. I hope she keeps improving. 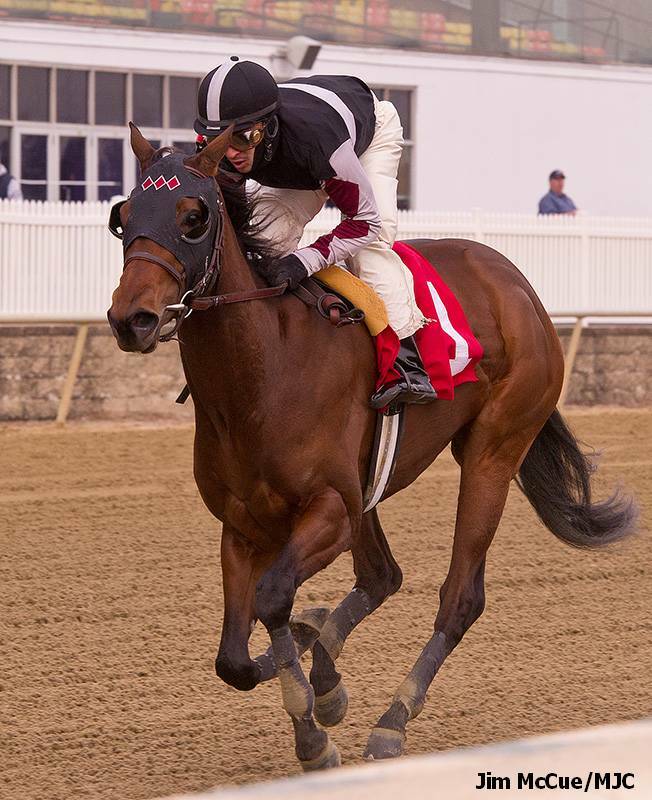 My ultimate goal is to have her run in the Black-Eyed Susan.” Walkwithapurpose is a daughter of the Sun Valley mare Lightning Lydia (Broad Brush), and is the 170th stakes horse produced from a Sun Valley mare. 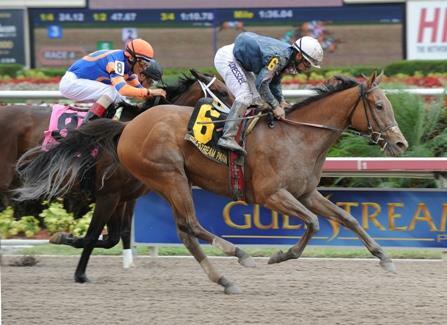 King David wins Jamaica, becoming Sun Valley's newest G1 winner! "I assumed I probably would get a stalking trip," Napravnik said, "and we sat in a great spot. I was able to save ground on the first turn. The turf is a little bit soft, so I took him to the outside. He just put in a very game effort. He's a horse I've been on a few times on the morning, and I always loved the way he went. He has a great demeanor, and he tried as much as he could." King Kreesa held second by three-quarters of a length from the unlucky Summer Front. After a gap of 2 3/4 lengths came the disappointing Cogito, followed by the similarly subpar Dullahan, and Shkspeare Shaliyah just edged the trailer Howe Great. Unbridled Command was scratched. Dullahan's jockey Joel Rosario cited the course condition as a factor in his dull effort. "It looked to me like he had a little hard time (with the ground), "Rosario said. "He was fine early, and when I rode him he tried to pick it up, but maybe it's a little slippery." In the wake of this successful stakes debut, King David improved his scorecard to 11-6-1-0 and inflated his earnings to $333,435. The dark bay colt failed to hit the board in his first four starts in maiden special weight company, but broke through for a $25,000 tag in his first try for trainer Larry Rivelli. A close second next time out, he went on to win three in a row, all in claimers. Nick Canani haltered him for $25,000 out of an August 13 victory at Saratoga, but lost him in turn after he stayed hot on September 13 over this course. Assistant trainer Pearl Hagadorn revealed that Maker had first tried to claim him in August. "Mike saw this horse at Saratoga, and lost a shake (to claim him) there, so he claimed him at Belmont," Hagadorn said. "He looks for an athlete that he thinks can improve with his program, and he's brilliant at it. And then, Rosie put up a great ride." Napravnik also commented on the astute claim. 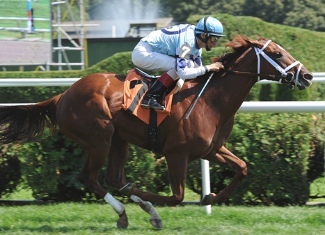 "King David is a horse I breezed in Saratoga under a different trainer," the rider said. "Mike does such a good job with horses that he claims, and this is just a very good example. This horse ran awesome. "I was on a private plane with Ramon (Dominguez) to New York last night. He had ridden the horse before and had won on him (in his last two starts), and we were just talking about the race he was running in. I said, 'You know what? Mike does this all the time. He's very good at turning it around, turning horses over, and doing a great job with them, especially on the turf.'" Ironically, Dominguez is the regular rider of Summer Front, and had to watch his old mount get the better of him Saturday. Bred by Ben Lengacher in Kentucky, King David is out of the unraced Gone West mare Storm West, who has also produced stakes victor Bertsgoldenmissile and Norwegian Group 3-placed Heureux. His third dam, French Group 2 queen Hortensia, is responsible for multiple Group 3 hero and dual classic-placed Glacial Storm as well as multiple Grade 3-placed stakes vixen Chaudennay. Other prominent descendants include current stakes-winning juvenile filly Baileys Jubilee, who recently placed third in the Group 1 Cheveley Park. King David was produced by the Sun Valley mare Storm West and was bred and raised by the Lengacher family in Indiana. Ever So Lucky, who started about seven lengths behind a pair of 2-year-olds – one trained by Sheppard, the other by Tom Voss – caught up to them by the wire in a half-mile workout that was timed in 46.77 seconds, the fastest of 51 works at the distance over the main track. Ever So Lucky, third to Street Life in the Curlin, could shorten up in distance in the Grade 1 King’s Bishop at seven furlongs on the Travers undercard. Sheppard said he would work Ever So Lucky one more time next week before deciding whether to take a shot in the King’s Bishop. By day 10, five of his six winners were juveniles, including Top Tier Lass, who romped home by seven lengths at first asking on the grass on July 30 in the 5TH race. Under John Velazquez, the daughter of dual Grade 1 winner Street Boss was away well at the start, contested the early pace while running in the four path, surged past the three in front of her when asked on the turn and extended her advantage through the stretch under a hand ride. The chestnut filly's time for 5 1/2 furlongs over the good turf was 1:03 1/5. Top Tier Lass herself was a recent arrival in upstate New York, having been sent to Pletcher's string at Monmouth Park after fetching $60,000 at the OBS March Sale of Selected Two-Year-Olds in Training. Out of the King of Kings mare Top Tier, a winner at 1 1/8 miles on the turf, Top Tier Lass caught Pletcher's eye when she breezed one furlong in :10 1/5. "We were finding quite a few of the Street Bosses we thought were interesting and she happened to be one that fell into our price range," Pletcher said of Top Tier Lass, who carries the colors of Lets Go Stable. Sent to Pletcher's string at Monmouth Park, Top Tier Lass "exceeded expectations" with several sparkling works on the dirt, and in mid-July joined Pletcher's barn at the Spa. A five-furlong breeze in 1:01 2/5 on the Oklahoma turf training track confirmed her natural affinity for grass and it was decided to give her a "little spin" on the grass. "We kind of talked about whether to go in the 5 1/2 or longer, and we thought with her pedigree we'd start off short," Pletcher explained. "Street Boss himself was primarily a sprinter on the West Coast. But this filly has some substance to her, stamina on the bottom side. "Today, she broke well and was a bit wide going into the first turn," he added. "It was a pretty straightforward performance. But I do think she will stretch out." Bred in Kentucky by Sun Valley Farm, Top Tier Lass was pinhooked for $27,000 by Halcyon Hammock Farm as a yearling at the Keeneland September Yearling Sale before being sold in March. First winner for Majestic Warrior is Sun Valley-bred! Grade I winning son of AP Indy, exciting young sire Majestic Warrior posted his first winner when the two-year-old filly Weekend Warrior (Majestic Warrior x Chic Thief, by Cat Thief) scored at Calder on Sunday. Prepared by Jose Pinchin, Weekend Warrior was third when making her debut on April 22 and then second on May 19, before breaking through for a well-deserved win at her third race start. Up with the pace early, she opened up a two length lead in the stretch and then held off her rivals to win the five and a half furlong maiden by three parts of a length. Weekend Warrior is a half-sister to stakes-placed Dark and Chic and is one of four winners from Chic Thief, a half-sister by Cat Thief to Grade III winner Radical Riley from the family of multiple Grade I winners Forever Together and Peaks and Valleys. The filly was bred in Kentucky by the partnership of Sun Valley Farm and Thumrong Wattanapisit. Standing at a fee of just $10,000, Majestic Warrior has made a big impression at the various two year-olds in training sales this year, his progeny selling for up to $700,000, so he's a young sire on a big upswing. The Ocala Breeders Sales March Selected Two-Year-Old in Training sales kicked off on March 13 posting gains of 33% in average price, and a generous 50% in median. Topping the sale was a handsome son of the hot sire War Front, purchased by Fletcher Racing for $800,000. The two-year-old was a homebred for Cherry Valley Farm, the breeding operation of Claiborne Farm president, Seth Hancock. The offspring of the Sun Valley Mares was not without fireworks of their own. Headlining the offering was a solid son of leading sire Tapit produced from the Sun Valley mare, Swigert. Consigned by Halcyon Hammock Farm of Hal Hatch, he was sold to Richard Santulli's Colts Neck Stables for $400,000. Hatch quipped "Every horseman here could see that this horse is developing--- he isn't a fully baked cake. Tapit is an outstanding sire, and he is hitting them out of the park right now. Physically, the colt takes more after his damsire-- he's got a lot of Fusaichi Pegasus in him." Next up was the chestnut son of Lion Heart and the Sun Valley mare Costume Girl. A solid and professional work paid big dividends for the connections of Bridlewood Farm, as agents when he was sold to B.J. Wright of Bluegrass Industries for $120,000. Two other Sun Valley homebreds, a Street Boss filly produced from the mare Top Tier, and a Sky Mesa colt produced from the stakes-producing Flying Afleet, each found new homes at $60,000. Veteran shoppers Let's Go Again Stables and West Point Thoroughbreds selected these two outstanding prospects to join their respective racing stables. All four offerings of juveniles produced by the Sun Valley Mares were sold for a total of $640,000, a solid average of $160,000. Not bad for the first boutique sale of the year! Fasig-Tipton's Kentucky Fall Yearling Sale was within the first hour of business, when Monday's sales topper entered the ring as Hip #16. The strapping son of leading sire Medaglia d'Oro was sold to Debbie Easter, agent to lead the sale's opening session at $200,000. Consigned by Denali Stud, agent, this son of Medaglia d'Oro was produced from the Coronado's Quest mare Especially Me, a half-sister to the graded stakes-winning Better Now. Especially Me was owned and sold by Sun Valley Farm, and is the dam of the second 2011 sales topper for a Fasig-Tipton venue. The 2011 Fasig-Tipton Kentucky Yearling sale was a tremendous success, with both gross revenue and average sales price increasing over 76% from 2010. $600,000 Indian Charlie Tops Fasig 2YO Sale! A stately Indian Charlie colt, which had created a buzz at the auction, lived up to all the hype when he fetched $600,000 to top the sale during its second session May 24. Patrice Miller of the Pennsylvania consulting firm EQB purchased the handsome bay colt, which worked an eighth of mile in :10 1/5 prior to the auction. Sequel Bloodstock’s Becky Thomas, who consigned the colt, bought him for $95,000 from Hill ‘n’ Dale Sales Agency, agent, at the 2010 Keeneland September yearling auction. She owned him in partnership with Dennis Narlinger and his son, Michael. Prior to the Fasig-Tipton Midlantic auction this year, Thomas consigned the colt to the Fasig-Tipton Florida select and Keeneland April select sales of 2-year-olds in training, but scratched him from both auctions. Out of the unraced Summer Squall mare Bally Storm, the colt is a half brother to three winners, including Silver Bayer (by Smoke Glacken ), who finished second in the Birdonthewire and Fasig-Tipton Turf Dash Stakes at Calder Race Course (now known as Calder Casino & Race Course) in 2008 and the Smarty Jones Stakes at Oaklawn Park in 2009. Bally Storm is a half sister to grade II winner Yarrow Brae (by Deputy Minister). Jerry Jamgotchian bred the $600,000 juvenile in Kentucky. 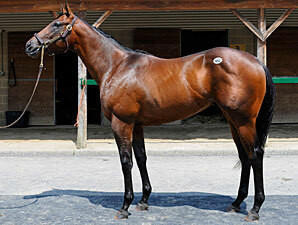 In 2009, Hill ‘n’ Dale, as agent, consigned the colt to the Keeneland November breeding stock sale but scratched him. The $600,000 sales topping son of INDIAN CHARLIE was produced from the Sun Valley mare BALLY STORM (Summer Squall-Bally Five, by Miswaki). currently on offer from Sun Valley Farm. Corkage, a fast bay daughter of More Than Ready consigned by Lynne Boutte, as agent, also brought $300,000 from Mandy Pope of Whisper Hill Farm. Boutte and her husband, Chris, live in Florida where they pinhook, break, and train horses. In the name of Black Swan Stable, they purchased Corkage for $50,000 from Taylor Made Sales Agency, agent for Najid Fares, at the 2010 Keeneland September yearling sale. They were acting on behalf of a partnership headed by John DeStefano, according to Lynne Boutte. Bred in Kentucky by Fares Farm, Corkage worked an eighth of a mile in :10 1/5 prior to the Fasig-Tipton Midlantic auction. She is out of the winning Unbridled mare Uncork and is a half sister to the winner Unhinged (by Dehere). Uncork is a half sister to added-money winner Chetten County (by Giant's Causeway) and a full sister to Detach, the dam of grade II winner Apart (by Flatter ). 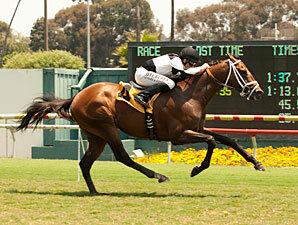 Apart scored in the May 21 William Donald Schaefer Memorial Stakes (gr. III) at Pimlico. Sun Valley mare UNCORK (Unbridled-Lovat's Lady). 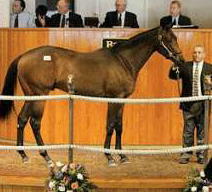 Uncork was sold to Fares Farm, the breeders of this wonderful filly. Uncork currently resides at Fares Farm. Bouquet Booth wins $500,000 Delta Downs Princess Stakes-G3! (TDN 11/21/10) Bouquet Booth gave her freshman sire his first black type winner with this rallying score to win the $500,000 Delta Downs Princess Stakes-G3 on Saturday, November 20. The dark bay started her career at Hoosier Park, running third in the slop August 15 and second by a head on a fast track September 17. She was coming off a handy seven furlong maiden win on the Keeneland poly October 15. Rated off fractions of :22, :47, and 1:12.2, she came charging down the far outside in the stretch to get up for a narrow decision over fellow closer Niji's Grand Girl. Pace setter Grandacious held well for third. BOUQUET BOOTH, a daughter of freshman sire Flower Alley, was produced by the Sun Valley Farm mare TOLL ORDER. Miss Jean Brodie runs 2nd in Darley Irish Oaks-G1! Miss Jean Brodie ran a brilliant race to finish second in the $550,000 Darley Irish Oaks-G1 in only her third career outing at the Curragh, Ireland, on Sunday, July 18. Successful in a Doncaster maiden on her previous start, the three-year-old daughter of Maria’s Mon, trained by Mahmood Al Zarooni, stayed on strongly in the straight on ground which was officially good to yielding. She shrugged off having to be re-shoed at the start and broke well from the stalls. William Buick raced her in mid-division of the 15 runners initially and then moved Miss Jean Brodie up to sixth as a good pace was set up front. The filly, brought wide in the straight to make her challenge, ran on steadily to take second well inside the final furlong. Miss Jean Brodie finished eight lengths behind the decisive winner Snow Fairy who completed a Classic double, having won the Investec Oaks at Epsom Downs previously. The winning time was 2m 34.87s. Miss Jean Brodie came home three quarters of a length ahead of the third Lady Lupus and Mahmood Al Zarooni commented: "She has run a very good race on ground that she liked. "The jockey rode her very well. She is still an inexperienced filly as this was only her third start. She ran a bit green and can hopefully improve again. "We will see how she comes back from this race before any plans are made for her." The other Godolphin runner in the Darley Irish Oaks was the Saeed bin Suroor-trained Hibaayeb with Frankie Dettori in the saddle. Hibaayeb, who won the Group Two Ribblesdale Stakes at Royal Ascot the time before on fast turf, was held up towards the rear and raced in 10th. She was asked to improve turning for home but made no progress and Frankie Dettori eased her down from two and a half furlongs out when she was beaten. Saeed bin Suroor said: "Hibaayeb didn’t like the soft going at all - she needs better ground." MISS JEAN BRODIE is a daughter of the Sun Valley Farm mare MISS KILROY (A.P. Indy), and was Sun Valley's second graded stakes score for the weekend following SUMMER MOVIE's runnerup finish in Hollywood Park's $200,000 Swaps Stakes-G2. First Street Boss foal arrives at Sun Valley! The first reported foal by Street Boss has arrived. The chestnut filly was born on January 26 at Sun Valley Farm and is out of the winning mare Top Tier (King Of Kings) who is already dam of a multiple winner in Show Place. Top Tier is herself a half-sister to two Stakes winners in Sand Ridge ($708,149) and Dootsie. The foal's owner, Barry Butzer, declared himself 'very pleased' with the filly. Street Boss, who stands alongside his sire Street Cry at Darley America, was an outstanding sprinter who smashed the course record at Del Mar when taking the G1 Bing Crosby. 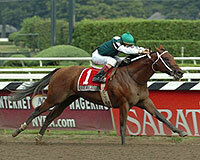 Also winner of the G1 Triple Bend, his fee for 2010 is $20,000 Stands and Nurses. Kodiak Kowboy was a symbol of versatility his championship season as a 4-year-old. He was a grade I winner not only at sprint distances of six and seven furlongs, but also at a mile. Kodiak Kowboy , who has been retired from racing for stallion duty at Tom Simon’s Vinery near Lexington, cemented his claim to the championship with a triumph in the Nov. 28 Hill ‘n’ Dale Cigar Mile Handicap (gr. I) at Aqueduct. His Cigar Mile triumph also was at the heart of Kodiak Kowboy’s being a finalist in the older male division. View Slideshow of this year's Champions. Kodiak Kowboy wasn’t your typical speedball who went right for the lead. But what he lacked in early speed, he made up for with a swift closing effort. He won the Cigar Mile in that fashion as well as the Carter Handicap (gr. I) at Aqueduct, the Vosburgh Stakes (gr. I) at Belmont Park, and the Donald LeVine Memorial Handicap at Philadelphia Park. Kodiak Kowboy overtook the extra tough Fabulous Strike in the final furlong in both the Vosburgh and the Carter, and recorded respective Beyer Speed Figures of 108 and 104. In the Cigar Mile, Kodiak Kowboy registered a 106 Beyer. 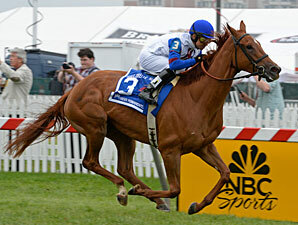 Following the Oct. 3 Vosburgh, Kodiak Kowboy was scheduled to contest the Nov. 7 Sentient Jet Breeders’ Cup Sprint (gr. I), but he failed to scope cleanly following a Nov. 2 workout and was pointed instead to the Cigar Mile. Bred in Kentucky by Hartwell Farm, Kodiak Kowboy (Posse —Kokadrie, byCoronado's Quest) raced his championship season for Vinery and Rick Porter’s Fox Hill Farm. He was trained first by Larry Jones and then by Steve Asmussen. KODIAK KOWBOY is out of the Sun Valley Farm mare, KOKADRIE. Christine Daae hits high note with impressive win! Strikingly marked filly Christine Daae (3f Giant’s Causeway x Descapate, by Dehere) blasted her rivals to win at Gulfstream earning a TDN Rising Star tag for her efforts. Fourth when making her debut at Hollywood back on July 9, the Patrick Biancone trained filly was immediately rested and given time to develop, re-emerging as a formidable force. Settling in third place on the outside, Christine Daae dropped her rivals cold in the straight racing away to win the seven furlong maiden by eight and three-quarter lengths in the time of 1:21 3/5. A big powerful chestnut, Christine Daae owes her name to an unusual marking on her head explained Patrick Biancone to TDN. Christine Daae will be given the chance to get over this run, but then connections will be looking at Black Type with her, the Group Two Davona Dale Stakes on February 27 put forward as a possible target. “With the Giant's Causeways, when they are good, they are really good--like him,” Biancone remarked. Christine Daae was produced from the stakes-winning Sun Valley mare, Descapate, a half-sister to talented stakes-winner Tres Coronas. Purchased for $100,000 at the Keeneland September Yearling Sale by pinhooker Don Graham, she was later sold privately for $400,000 to Biancone and runs for Michael Imperio and Kona Stables LLC. Falling prices, overproduction, credit crisis and a world economy in turmoil are the day’s headlines everywhere you look. We have become a culture reliant on financial data available almost moment to moment-- “fast food finance” is the term I use. We are so transfixed on tomorrow that we forget that today is the only thing within our control. If you have been involved, or would like to get started, in the Thoroughbred industry, I personally feel that this is very likely the time to get on board. After years of double digit gains in sales prices for the Thoroughbred, 2009 will become known as the year that turned back time. It was a year of diminishing auction returns, falling stud fees, and the over-production correction that will ultimately turn this business inside out. If you are a supply and demand believer, the recent changes exacted upon this market may well set the stage for tremendous gains in the future for those with enough fortitude to see it through. Sun Valley, like any other responsible entity, has made necessary adjustments to our business plan. I personally feel that many of those most severely affected by today’s problems, were those who were inexperienced or overly-optimistic about their own operations, many of them heavily leveraged. Getting in “when it’s hot” is a recipe for disaster, and certainly takes more money, at a time when you generally get less for more. We have never subscribed or advocated any of our clients and friends to take such action, in fact, just the opposite. Now that the correction in the horse industry is well underway, elements of value are beginning to present themselves in the marketplace. For instance, the mares available for sale on this website are priced at near historic lows. The procurement costs for these mares has been reduced, along with the fees of the stallions to whom they are currently in foal. This does not mean that their value is less, it only means that they are available for less. Our ability to select “the next important producer” continues at a steady pace, almost one stakes horse per month, as evidenced by last week’s G1 performance by millionaire Kodiak Kowboy. Additionally, with 2010 stallion fees falling another 30% next year, the savings alone could be substantial enough to offset the care of your mare’s annual board at Sun Valley. All of these tangibles are hard to ignore, and have created a scenario similar to the early years at Sun Valley. History repeats itself, and one of my favorite quotes puts it best-- “For some reason people take their cues from price action rather than from values. Price is what you pay. Value is what you get”—Warren Buffett. Our goal at Sun Valley, is to always offer uncompromising value and integrity to all of our business relationships and to provide a means of support that extends long after the sale. Call or email today to find out what Sun Valley Farm can do for you. Happy Holidays to all, and best wishes for a happy, healthful and prosperous New Year. 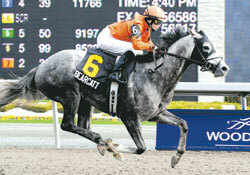 Bearcatt "pounces" to win $150,000 Woodstock Stks! ETOBICOKE, Ontario - Bear's Rocket was a hot item but finished second as the 4-5 favorite here in last Saturday's $100,000 Wando Stakes. Bear It's True was cold on the board and finished last of six as the 14-1 outsider in Sunday's $150,400 Woodstock. But, Bearcatt was just right, capturing the six-furlong Woodstock at just under 6-1 to give trainer Reade Baker and the Bear Stable of Danny Dion their first stakes win of the meeting. 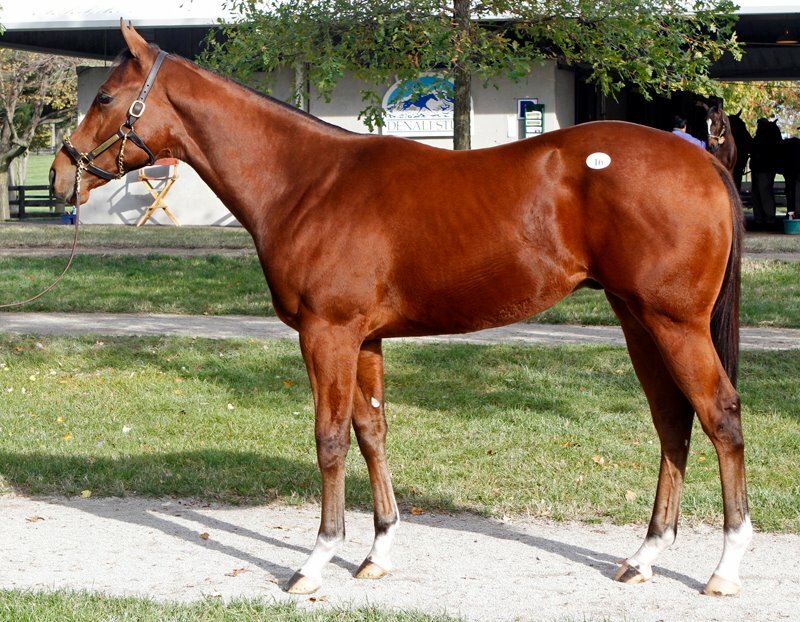 Bearcatt, a Kentucky-bred who was purchased for $190,000 at Fasig-Tipton Kentucky's July yearling sale, started twice here at 2, finishing second at five furlongs and then graduating at the same distance while prominent throughout. Baker, however, had maintained that Bearcatt would be effective coming from off the pace and was vindicated when the colt rallied from last place in the Woodstock to score by a going-away 3 1/4 lengths under jockey Emma-Jayne Wilson. "Obviously, you can do whatever you want with him," Baker said. Bearcatt had been amongst the Florida contingent wintering with Baker at Palm Meadows but did not see action in the south. "I'd been toying with putting him in the entries at Gulfstream, but there was a race in the proofs for the condition book at Woodbine on opening day," Baker said. "I entered him there, but the race didn't fill." The lack of a prep obviously had no bearing on Bearcatt's performance but, with the next open stakes race for 3-year-old being the 1 1/16-mile Marine here May 16, his connections may be looking out of town for a shorter trip. Bear's Rocket, who had finished a close second in the Grade 3 Holy Bull at Gulfstream and a respectable sixth in the Grade 3 Tampa Bay Derby, should be looking to redeem himself in the $150,000 Marine. Bear's Prospector, an impressive winner over 6 1/2 furlongs here April 18, also is a Marine candidate. --- Bearcatt was produced from the Sun Valley Farm mare NASCAT (Hennessy-Becky Be Good, by Naskra) who resides at Barry Butzer's Sun Valley Farm. Congratulations to the connections of Bearcatt, Sun Valley's 137th stakes horse! Swiss Ace "wire-to-wire" winning Oakleigh Plate-G1! 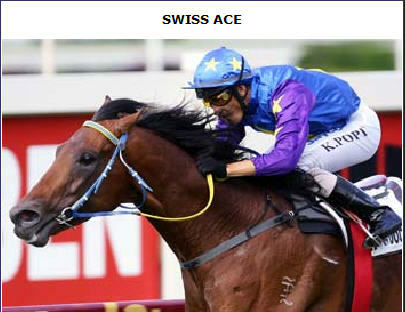 "Swiss Ace scores in the Oakleigh Plate-G1"
Swiss Ace goes "wire-to-wire" winning Australia's Oakleigh Plate-G1! Reprint TDN 2/22/09. Swiss Ace entered top form during last year's Queensland winter carnival, capturing the G2 Sir Bryne Hart Stakes before placing third in the G1 BTC Cup over the same trip as the Oakleigh Plate (G1, A$400,000). He resumed January 31st to finish seventh, defeated 2 1/2 lengths by Scenic Blast in the G1 Lightning Stakes. Jumping straight to the lead in a capacity field, the bay came out swinging and fought back when headed in the straight by Lucky Secret, to give his recently deceased sire Secret Savings his third G1 winner. --- Swiss Ace was produced from the Sun Valley Farm mare Rapid Serve (Carson City-Tennis Partner, by Northern Dancer) who was sold to Nasser Abdullah Lootah's Emirates Park Stud, breeders of Swiss Ace. Congratulations to the connections of Swiss Ace, Sun Valley's 134th stakes horse! The landmark Keeneland September Yearling Sale held in Lexington, KY is beginning to wind down, and the results are now in the record books. Through Book Five, some 2,492 yearlings have been reported to have found new homes, accounting for proceeds of over $313,000,000. While the average selling price of over $125,000 is nothing to sneeze at, the average showed an 11.5% decline from yearlings sold at the 2007 venue. That being said, buyers and sellers alike, have heaped praise upon these results in such economically challenging times. Sun Valley and their clients would have to agree, that this sale provided them with results that were nothing short of glowing. The first ten yearlings through the auction ring, produced from mares sold by Sun Valley Farm, averaged $188,000. Many of these yearlings took different paths on their way to the Keeneland. Some of them were bred by Sun Valley Farm and their clients, raised on Sun Valley, and sold as weanlings last fall or as yearlings this past week. 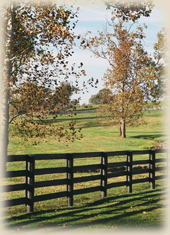 Others were produced from mares sold to clients a few years back, raised on their owner’s farm or another Central Kentucky nursery, and were spread among various consignors. In Keeneland’s Book 2, a bay colt (Tiznow-Storm Celine) led the charge at $435,000. Sun Valley had owned and sold both the first and second dams. This daughter of Storm Cat has produced two stakes winners to date, and rewarded her connections handsomely. Longtime Sun Valley clients David and Jean Coia’s One Special Lady did not disappoint on day four of the sale, as her Tale of the Cat colt lit up the board at $270,000. One Special Lady could not have been more aptly named for the Coia’s, as her total sales progeny now nears $750,000! As Book 3 began, two Sun Valley homebreds sold for $270,000 and $120,000, both showing impressive gains from their initial purchase prices in 2007. A strapping son of the Sun Valley mare Attitude caused a stir when entering the back walking ring, selling to Jay-Em-Ess Stables for $270,000, from the consignment of Gerry Dilger’s Dromoland Farm. Mr. Dilger had purchased this colt as a weanling for $150,000 at the Keeneland November 2007 Breeding Stock Sale, and stands the colt’s sire Eurosilver. A lovely daughter of Tale of the Cat and the Sun Valley mare If Angels Sang made $120,000 for her owners, Kathryn Nikkel and Judy Hicks. Kathryn and Judy purchased the filly and her dam privately from Sun Valley last year. In the final hour of the sale, another Sun Valley graduate stepped up to the plate and delivered the grand slam. Bred by Charley Trimble and raised at Sun Valley, this elegant daughter of Maria’s Mon and Miss Allen, landed a spot on the day’s sales topper list at $310,000. The first five books of September revealed plenty of highs and lows, and the analysis of the entire sale is a work in progress. As for Sun Valley Farm, and the businesslike approach to our equine investments for ourselves and clients, Keeneland Books 2 and 3 clearly illustrate careful planning pays off. While these four comprehensive sessions at Keeneland turned in a healthy average of $162,000 (approximately 3.5X stud fee) overall, Sun Valley graduates commanded results averaging over $205,000 (6.6X stud fee). Clearly, the Sun Valley yearlings not only exceeded the Keeneland average by 26% , but most importantly did it with significantly less stud fee investment per yearling, thereby adding an additional 25% profit. KODIAK KOWBOY WINS GII SARATOGA SPECIAL!!! A "Kodiak Moment" in the Saratoga Special-G2! <?xml:namespace prefix = v ns = "urn:schemas-microsoft-com:vml" /><?xml:namespace prefix = o ns = "urn:schemas-microsoft-com:office:office" /><?xml:namespace prefix = w ns = "urn:schemas-microsoft-com:office:word" />KODIAK KOWBOY, out of the Sun Valley mare KOKADRIE, boldly scored an impressive win in the Grade 2 Saratoga Special Stakes going six and one-half furlongs over the fast main track at Saratoga Race Course! KODIAK KOWBOY broke sharply from post one, but jockey Shaun Bridgmohan chose not to have him engage in the early pace battle. Sitting just off the leaders down the back stretch and around the turn, KODIAK KOWBOY was full of run, but with another colt alongside, he was boxed in. A seam opened between the two pacesetters at the top of the stretch and KODIAK KOWBOY didn't hesitate to split his rivals with a powerful move. Clearing the field, he took off for home and galloped on to win by three lengths. He stopped the clock in <?xml:namespace prefix = st1 ns = "urn:schemas-microsoft-com:office:smarttags" />1:15 4/5, which equaled the stakes record. 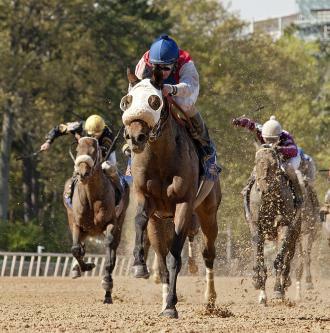 “He ran well,” said trainer Steve Asmussen. “The concern today was the inside. He had such a beautiful stalking trip in all three of his victories; (in those races) he was in a three-wide stalking position." KODIAK KOWBOY races for the partnership of Vinery Stables and Fox Hill Farm. He has won four straight races and four of his five lifetime starts and he has earned $294,825. KODIAK KOWBOY WINS G3 BASHFORD MANOR! Kodiak Kowboy wins Bashford-G3 in sparkling performance! KODIAK KOWBOY completed a memorable day for trainer Steve Asmussen as he rallied from third to pull away under jockey Corey Lanerie to a comfortable 2 ¾-length victory in Saturday’s 106th running of the $165,150 Bashford Manor Stakes (Grade III) for 2-year-olds at Churchill Downs. A son of the hot first-year sire POSSE, KODIAK KOWBOY covered six furlongs over a “fast” track in 1:09.15 and paid $5.80, $3.40 and $2.40. Dr. Nick rallied from last in the six-horse field under Mark Guidry to grab the runner-up spot and paid $5.20 and $3.60. Crackalackin, ridden by Jamie Theriot and one of three horses in the field trained by Asmussen, paid $3.80. 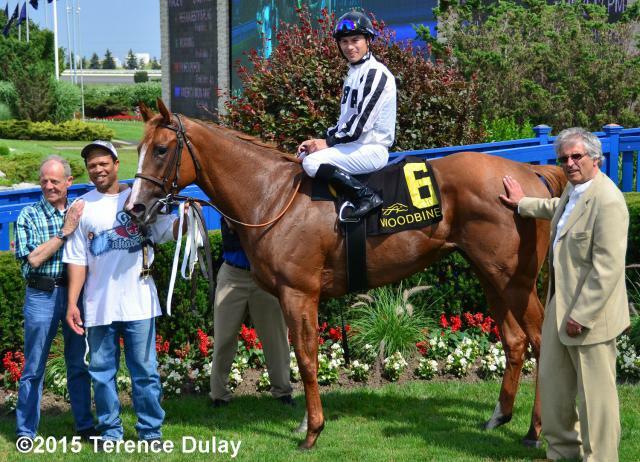 KODIAK KOWBOY , who is owned by Vinery Stable, won his third straight race following a loss in a two-furlong race in his career debut at Canada’s Woodbine on April 29. He nearly doubled his career earnings as the winner’s share of $101,373 raised his bankroll to $204,825. He had returned to Woodbine to win the $125,000 Victoria Stakes in his previous start. 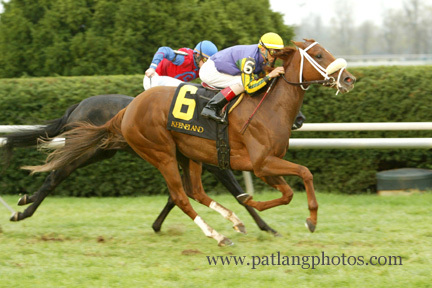 It was the second victory in the Bashford Manor for Asmussen, who won the race with Lunarpal in 2004. He saddled KODIAK KOWBOY's sire, POSSE, to a runner-up finish behind Lone Star Sky in its 2004 renewal. Hargill broke alertly at the opening bell and battled with Motovato for the lead while leading the field through brisk fractions of :21.60 for the quarter mile and :45.19 for the half-mile. KODIAK KOWBOY and Lanerie patiently tracked the leaders three-wide in third, just ahead of Crackalackin, and Blackberry Road and Dr. Nick were at the back of compact field. Lanerie sent KODIAK KOWBOY after the leaders on the far turn, assumed the lead at the head of the stretch as the field of six spread across the track and drew away through the stretch. Dr. Nick was forced six-wide in the stretch as he rallied from last to gain second, while Crackalackin and Blackberry Road rallied for third and fourth, respectively. Motovato faded to fifth, while early pacesetter Hargill finished last. “He broke sharp, and I could see that other horse (Hargill) up there pressing the three, so I wasn’t too worried about the three horse (Motovato)" said Lanerie. "My horse was a little more speedier than him. From there, I started to ask my horse; he had every opportunity to win. Those two hooking up in the middle of the turn, and my horse was just waiting for the call. I tapped him on the shoulder and he about jerked me out of the saddle. From there I just kept him busy. I was just a passenger. Asmussen would not speculate on where KODIAK KOWBOY might race next, but indicated that he had faith that the colt would thrive at longer distances. KODIAK KOWBOY becomes Sun Valley's 115th Stakes Horse! 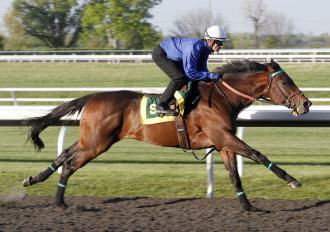 KODIAK KOWBOY was a very impressive maiden winner at Churchill on May 26, just missing the track mark by 1/5th second. 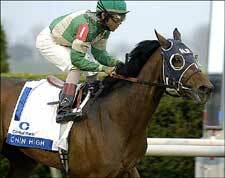 KODIAK KOWBOY became the 115th stakes horse for a mare owned/sold by Sun Valley Farm with a decisive victory in the $125,000 Victoria Stakes at Woodbine on June 17, 2007. Here he shadowed the leaders, rallied wide between foes and proved toughest as he dug in and edged away late. "When we were in tight, he had his ears pinned and he was really game" noted winning rider Emma-Jayne Wilson. KODIAK KOWBOY was produced from the Sun Valley mare KOKADRIE (Coronado's Quest), and was not the only Sun Valley connection in the $125,000 Victoria that day. YES IT'S BULL (Yes It's True) finished two lengths behind to secure the 116th stakes horse for Sun Valley. YES IT'S BULL was produced from the Sun Valley mare Heart of the Bull (Holy Bull). Flash! Homebred CHIN HIGH becomes Sun Valley's 101st Stakes Horse! Chin High gives hometown trainer a win in Transy. Neil Pessin is from Lexington and has stabled at Keeneland for years. On the opening day of the spring meeting Friday, his Chin High pulled a major upset in the $150,000 Central Bank Transylvania Stakes (gr. IIIT) for 3-year-olds. The son of Smart Strike shocked the solid field of turf runners by winning the mile grass race by one length under Shaun Bridgmohan and paying a whopping $139. It was the third stakes win at Keeneland for Pessin, who won the Elkhorn (gr. 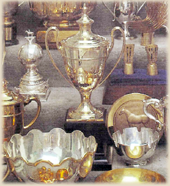 IIT) and Keeneland Breeders' Cup (gr. IIIT) in 1993 with Coaxing Matt. It was not hard to understand why Chin High was such high odds. He had started four times, breaking his maiden in his last start at Evangeline Downs. He had started once on turf, running fifth last year in a race at Arlington Park. It was no surprise to Pessin, though. "Yeah, we've kind of been pointing to this spot for awhile," Pessin said. "When we entered we thought we had a big shot to win. 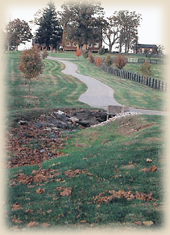 We don't own any of the family, so we weren't looking to get stakes-placed." The winner, who completed the eight furlongs on firm going in 1:37 4/5, earned $93,000 for owner Ike Thrash. Pessin said a final decision will be made later on a next start for his bay colt, but noted that Chin High is nominated to the Mid-America Triple series at Arlington Park. Chin High was entered in an non-winner of one other than allowance race at Keeneland Saturday and Daily Racing Form had him 30-1 in that race. But while the 4-5 favorite, Bobby Frankel-trainee To Sender, began retreating on the backstretch in the Transylvania, Bridgmohan had Chin High poised for his late kick. Wherethewestbegins made the lead as the field turned for home and had every opportunity to spurt away to win, but he hung a bit down the stretch as Chin High and Le Plaix, under Edgar Prado, came with their big runs. Chin High, fourth as the field reached the furlong marker, exploded to the lead and held off Le Plaix, with Wherethewestbegins staying on for third, a half-length behind the runner-up. "t was a little bit difficult doing it but he kinda managed to bull his way through there and get ahead of them," Bridgmohan said. Chin High was ninth in the field of 10 early as the Irish-bred In A Flash staked fractions of :22 1/5, :46 and 1:11 4/5. "Midway down the backside I nudged him a little and thought I'd give him a little encouragement and he picked it up pretty good," the jockey noted. It goes without saying that the gimmicks were huge. The extaca paid $1,239.20, the quinella $339.60, the trifecta $12,907.80, and a ten-cent superfecta with Unbridled Behavior fourth paid $3,409.34. Keeneland's first of 15 racing days drew 18,031 people, a record for a Friday opening in the spring. The previous record was 15,811, set last year. Friday's total included 3,417 students drawn by $10,000 in college scholarships. In A Flash finished fifth, followed by Readily, Tompest, Dawn of War, Indian Hawke and To Sender. "He got hit from behind by another horse about 50 yards out of the gate and never really relaxed after that," said jockey Alex Solis of the To Sender. Bred in Kentucky by Sun Valley Farm, Chin High is out of the Sunny Clime mare Damie's Sis. Sun Valley's Marsh Cat produces $1,000,000 Barretts 2yo! Marsh Cat (Storm Cat-Marshua's Echelon) became Sun Valley Farm's most recent success story when her current 2yo colt (by Grand Slam) was the second high seller at the Barretts Two Year Old in Training sale held on March 15, 2005. Congratulations and best wishes for continued success to Marsh Cat's owner, Jehan Malherbe! Farms, he was purchased byHirokazu Sumida, agent. be more than pleased if he ended up racing in the U.S.
Japan.” But the bottom line is getting them well sold. Reprint courtesy THOUGHBRED DAILY NEWS. Paddy's Daisy...Sun Valley's 89th Stakes Horse! Paddy's Daisy cruising to victory in Keeneland's $100,000 Jessamine County Stakes. Florida breeder/owner David Coia Sr, who spent his first several years in racing, selling all the horses he bred, picked a good one to keep in Paddy's Daisy. "I had a good feeling about the filly" he said. "Six hours after she was foaled, I was presented with an offer to sell her". Paddy's Daisy has lived up to Coia's expectations in a big way. She has won three stakes: the second division of the November 26 Miesque Stakes (G3) at Hollywood Park, plus the Salem County and Jessamine County Stakes, also on the grass. She has won four of five races on the turf after finishing unplaced on dirt in her first start. "If you look, you'll see her Miesque was run in faster time than the other filly's time" Coia said. Coia bred Paddy's Daisy in the name of Stonehaven Farm, and he races her in the farm name. "It's not an actual farm, but I'm looking for one" said Coia, a resident of Dunedin, Florida, who emigrated from Scotland 40 years ago. Paddy's Daisy was foaled at Barry Butzer's Sun Valley Farm near Versailles, Ky. "It was Barry's father who made the offer", said Coia, who bought Paddy's Daisy's dam, Mrs. Paddy (by Woodman), privately from Sun Valley. "I board all my mares there". Paddy's Daisy in trained by Todd Pletcher, whose father, J.J. Pletcher, was involved with Paddy's Daisy's early training. Co-owner of Pletcher-Massey Stables near Ocala, Florida, Pletcher had the filly in his care from September of 2003, until May of this year. Coia, who is in business with sons David Jr. and Ricardo, is a real estate developer and owns Subway restaurants. The family business also is involved in developing a resort complex in Antigua. Sun Valley Weanlings Headline Keeneland's Biggest Day! Text reprinted courtesy, Thoroughbred Daily News (11/10/04). Copyright 2019 Sun Valley Farm. All rights reserved. Site designed and programmed by Hammond Communications Group, Inc..